So light but very cozy. The only thing I didn't like about it was it did not have strings or button holes to hold to the duvet cover. But other than that it was very good quality and very comfortable. Shipped really fast! Cool and lightweight, this excellent comforter incorporates a mix of genuine goose down and goose feather fill with a crisp white cotton shell. While not as warm as extra warmth or medium-rated comforters, this all-season piece is perfect for the warm summer months, and features sewn-through box stitching to help with fill distribution and increase longevity. This comforter is the weight stated and the baffles look reasonable. I paid $** and I now understand that in 2014 for that price the white goose down all contain spines. It is clearly not expensive though after adding the Duvet cover of your choice, it may not be noticeable. The recommend to a friend is more how much money do you have to spend ? If you are richer buy something better. For the price, it is what you get. The cover is the perfect weight for summer or winter....not too warm and light enough to be usable in the warmer months. The only issue I have with it is that it makes a rustling noise due to the tightly woven fabric. But I put a duvet cover on it and now it is fine. Ample size too for a queen bed. No worries about feathers falling out or poking through....the weave is very tight. Excellent value. This comforter is warm, soft, fluffy and heavenly to sleep under. There are no pin feathers to poke you and the quilting is done so well that it fluffs up fully with just a slight shake. Hard to get out of a bed with this comforter on it. I was hoping, given the price, that this would be a lasting purchase. So far, I am very happy with the overall quality of this comforter. From the quality of fabric, to the warmth and lack of any signs of poor workmanship, this item is exactly what I'd hoped for. Thanks. Arrived very compact, and I fluffed each square before putting it in duvet cover, and it fluffed additionally over the course of a week. About a month later, it is at maximum fluffage and perfect for padding feet, knees, and arms when an extra pillow is lacking. It does get a little bit hot when the AC isn't running but overall fine for New Orleans temps unless you only have a fan or window unit. Might be too light for cold climates depending on the cover you put over it. It's the perfect tread between heavy and light, usually on the lighter side, and if you fluff it right, it feels weightless, or doubled or clumped, it feels heavy. Overall, a fantastic comforter and a big upgrade from the polyester filled mess we had before. The perfect fill to my favorite duvet. Its Beautiful and i love it. The goose blend comforter is so warm and it is light weigh you dont need anything but the comforter,it is so nice to just cozy up with. Overall I like it..I plan on getting the comforter protector for it so it will look more like a real comforter. It comes shipped vacuum sealed but it does fluff up nicely after about a week. Not too hot to sleep under in the summer. This Comforter is Just What I Needed! I ordered this comforter based upon the positive reviews I read. They were right! This is a great buy and the feathers are all intact. I moved into my new apartment and had all my blankets still in boxes but I remembered my comforter was just delivered. I used it and it was perfect. I was extremely warm and it was fluffy. I can't wait until my duvet cover set arrives. This comforter is very light, so it's perfect for year around use if you live in a warmer climate. Some reviewers said it didn't fluff up after being taken out of the packaging. I put it in the dryer with a tennis ball for 20 minutes or so and it fluffed up perfectly. For this price, it's a great deal. It is exactly what you see and what it says. I love it!! Living in Dallas, TX the weather is so unpredictable. This comforter takes care of the summer and the winter! Bright white and beautiful in my bedroom. Easy to clean. Received purchase within a week and delivered in great condition. It's nice. It does take a few days to fluff up, and now that I've had it a couple months, I'm noticing some father leakage but overall not bad. Good for the price but kind of lacking in real substance. Was hoping this would be a bit heavier and warmer, but for the price probably should have expected this to be lighter in weight. Soft lovely and comfortable beyond comfortable! I would buy this again 10 times over. Overstock seems to carry great choices for bedding. Would buy this again and I probably will for the guest room. The size is great, but keeps us a little too warm in winter and summer months. This is a great comforter. Perfect weight so I use it all year. The down has stayed in place and not bunched up. Would definitely recommend. It is a medium thickness comforter that works great not matter what weather is around. It did not have any smell that some of the feather/down products have. By all means I recommend purchasing of this comforter to other customers! "Does the comforter have tie corners to attach to the duvet cover?" Just regular comforter corners, I just use this as a comforter, love it. No, but that is certainly easy enough to do. 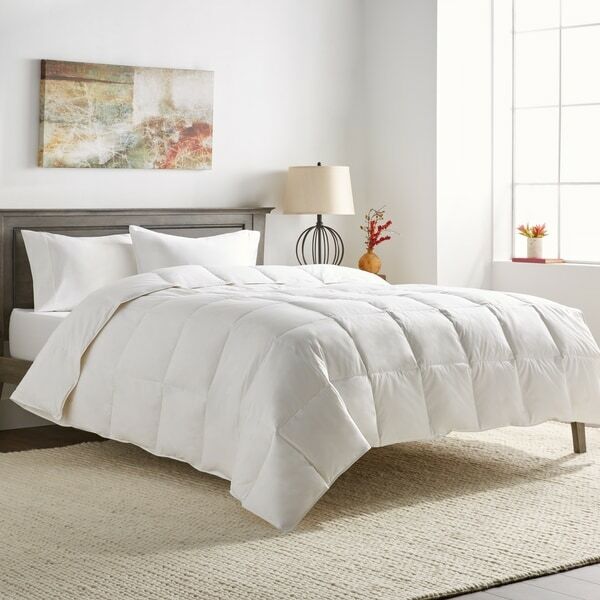 "Hello Anyone I just received my comforter about a week ago and I haven't used it yet I have laid it out so it can get it's fluff back however so far after a week it's still flat. What can I do. I have not put it on my bed yet. its a King"
You have to fluff it like a down pillow and then it'll look perfect! Try putting it in the dryer on low or no heat to fluff it up! "Is this comforter fully baffled?" It is! 👍 Hasn't lost its luster and I've used it all winter! Hello savvy southern shopper, customer reviews indicate that the comforter is fully battled. Thanks for shopping with us! "What is the weight of the down in the king size comforter? Jody"
Hello Jody, the king size comforter has 32 oz of fill. I hope that answers your question, thank you for shopping with us. "What size is the full/queen...it states to see details....where's details?" Hello peace1950, the full/queen is approximately 88" inches long x 88" inches wide. Please let us know if you have additional questions. Thanks for shopping with us. Hello momzup022, the King is approximately 88 inches L x 104 inches W. Thank you for shopping with us.